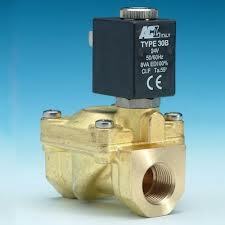 where high relaibility GSR Solenoid Valves in Stainless Steel or Brass is needed. Applications for use in,high-pressure applications up to 900 bar,high temperature applications up to 400°C,in natural gas filling stations,for hydrogen,in the food processing industry,for water treatment,for high viscosity media as wax, oil, resin, colours or in the car wash industry and automotive industry. ACL E107 Series - 2/2 N/Closed Pilot Operated Diaphragm Valves. The Valve Body is made of Brass. Seals available is NBR, VITON and EPDM. The Operating pressure Range is 0,15 to 15 Bar.